I have really been enjoying the books from the late great Joe Kubert Presents series, but issue two had these incredible sketches, which really deeply struck me. 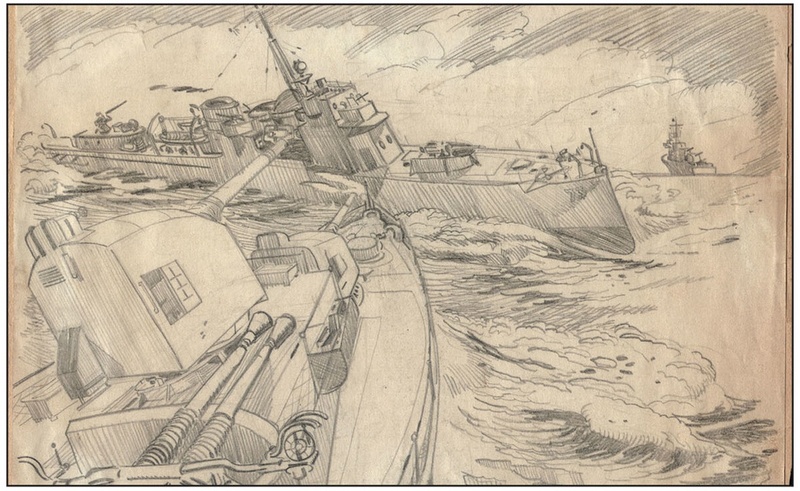 Sam Glanzman has worked for Marvel and DC and drawn many titles focusing on his time involved in naval warfare. My familiarity with him was only a cursory recollection of the name, but Joe Kubert has highlighted some of his astounding work. 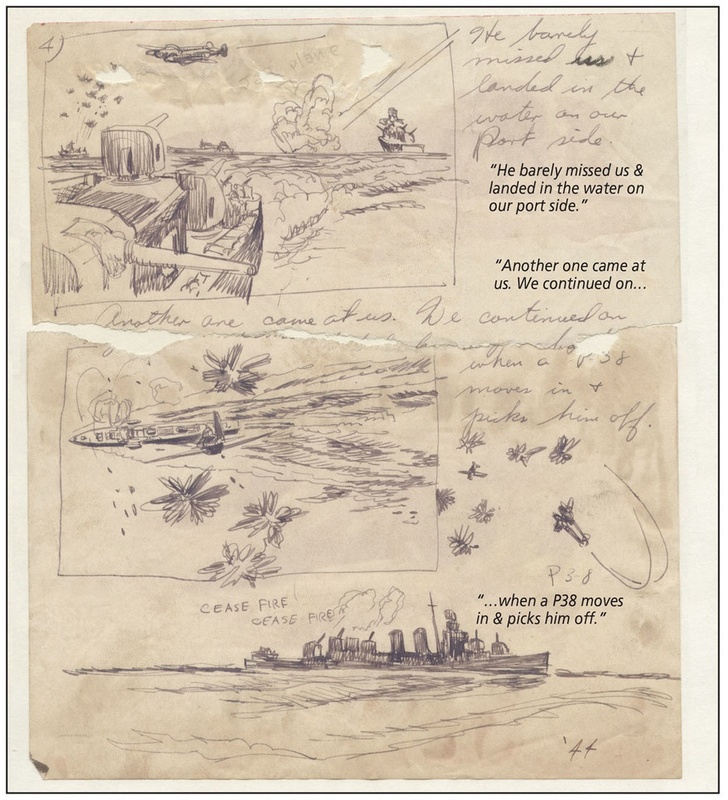 I am unsure whether it is because Glanzman actually served on the USS Stevens, or that his images are so dramatic, dynamic and realistically. They resonate with me and the work displayed just appears to be fluid and moving as if an imbedded GIF file. The first image has been annotated with Glanzman’s actual notes, which surprisingly add a personal touch to the page that is literally exploding with life. The three images on this page are from different angles, and the exploding shells are drawn like wild flowers. The perspective is really apparent as we see the plane flying down from above, and also across his ship dropping bombs as it travels. The exploding water mushrooms and the return fire of the adjacent ships seem so real, with basic pencilling movements. The story of this page is immense, and this being a personal experience heightens the fear and emotional relief when the P38 shoots the plane. This single scene again highlights the two key features of Sam’s sketches, the perspective and motion. The depth perception on the page is almost three-dimensional, as it is convincingly looks like the ships are swaying. They are angled as if they are unstable and you can imagine them rocking with the waves hitting the hulls. The rain is drawn simply as parallel lines in one direction but combined with the ships’ movement and the sea crashing, I feel like I am becoming a little seasick. I really feel the need to read some of Sam Glanzman’s best books as it is an essential in my collection. It has been my highlight of the Presents series, and this issue contains an actual comic strip called Squish Squash and the Comic Book Crew; an amusing tale of a new ship skipper. By far the best pages are of the planes in attack formations and decimating each other, it’s quite easy to enjoy but if I knew Sam Glanzman was on those boats, I would be devastated. I have been reading this series as well and I have really enjoyed the Redeemer story by Kubert himself…I like the Glanzman stories and art but my favorite story in all of them has been “Spit” the story of the young orphan on the Whaling ship…I have always found that era of history particularly interesting..You had to have some pretty big stones to get on a Whaling ship back then! For sure! The Spit section is so beautifully drawn, and it really captures his loneliness too! Thanks so much for honoring Sam with this awesome piece!